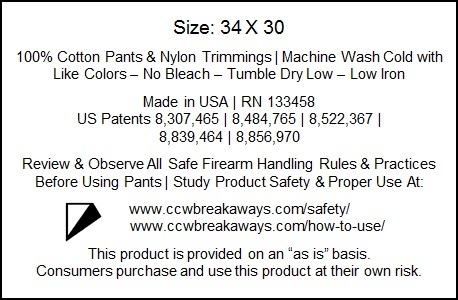 How do I care for my CCW Breakaways Pants? Are they machine washable? Can I have them to a dry cleaned? Please examine the sample Care Tag on the rear inside pocket. We do encourage the use of COLD water. With today's detergents, hot water is not needed and it will only wear out your clothing faster. And yes, machine washing is fine. To make your dark fabric colors last longer? We recommend using Woolite Dark Care Laundry Detergent. Dry cleaning? We do not endorse this process. While our pants are 100% cotton, the holster-pockets are manufactured from rip-stop nylon and Velcro. These items are synthetics and we cannot ensure that the solvents used in each dry cleaning facility would be compatible with nylon and Velcro. You can have the pants professionally laundered. Launderies do offer services for washing and pressing sharp creases into your pants if that is your styling preference.